What do you do in a Bar Method workout? Every Bar Method class starts with a warm-up, upper-body exercises and pushups in the middle of the room, followed by a sequence of leg work at the barre and core exercises on the floor. The method predominantly uses your own bodyweight for resistance along with a few basic props - free weights, mats and a ball. Students are continually challenged with endless variations of each exercise timed to the beat of the music, so that each class feels unique. Students of all levels work within their individual limits while receiving encouragement to continually push forward. How is The Bar Method different from other barre workouts? Your DVD and Online workouts do not include the “round-back” and “flat-back” exercises you give in your studio classes. Does their absence change the results I get when I use the DVDs? The Bar Method’s “round-back” and “flat-back” exercises do have unique benefits. They spike your heart rate, taper your leg muscles, tighten the muscles around your waist, and strengthen your core. To perform them however, you need a bar that is securely attached to a wall, which most DVD users do not have at home. Our DVDs make up for the absence of these two exercises with a quickened pace and extra bar-work to shape your legs and carve your abs. The intensity generated by these added elements enables you to get a Bar Method-sculpted body by either at a studio or at home. Am I too old to take the Bar Method? Bar Method studios welcome and support students both young and old. There’s no specific age limit, and in fact our classes include a wide diversity of age groups, from students in their 20s to their 70s. One reason the Bar Method is doable for older students is that teachers call out options for all exercises. Very strong students can choose to do one option, while others who are just building their strength choose another one. That way, all students get the best workout for their level of fitness. I have a tendency to bulk up. Will the Bar Method trim me down? Yes. The Bar Method will trim down your entire body, particularly your legs. During the first three-to-five months that you take class however, your muscles feel more present than before and so seem to be fuller. This is because newly toned muscles hold additional water, and also because intra-muscular fat has been pushed outwards. After around five months of classes, the intramuscular fat will burn away, your muscles will become more compact and elongated, and you will lose inches. Can I do the Bar Method in conjunction with other exercises? Yes. The Bar Method is a comprehensive, full-body workout, so it will help you build and maintain a high level of fitness. You don’t need to supplement the workout with additional strengthening, stretching or aerobic exercise, as long as you come to class three-to-five times a week. The Bar Method also works well in conjunction with many types of exercise. Taking The Bar Method is a fantastic way to train for sports, and it will boost your performance in many other kinds of exercise such as biking, skiing, running, hiking, basketball and dance. How often should I do The Bar Method? Research shows that you get the best results from exercise by working out three to five times per week. The Bar Method is non-impact and safe for your joints, so unlike some other workouts you can do it up to six days a week and still allow enough time for your muscles to recover. We advise that students listen to their bodies to find the frequency that works best for them. If you feel yourself getting stronger and feeling more confident, your frequency is at a good level. If you start feeling fatigued, you're probably over-doing it. The right frequency for you also depends on what else is going on in your life. If you're working 10 hours a day and not getting a lot of sleep, you might try taking class three days a week to see how that feels. Always be sure to listen to yourself and your body! Is The Bar Method aerobic? Yes. The Bar Method workout is fast-paced and challenges both your cardiovascular system and your muscle strength, creating an intense workout that burns calories throughout the class as well as for several hours after the workout. Is The Bar Method for men? While you will see many women in a typical Bar Method studio, we have many male clients who love the workout as well! There are some incredible benefits of barre for men, including increased flexibility, improved core strength, and enhanced endurance. It’s non-impact, safe for the joints and a great cross-training workout for many other sports and activities. We encourage and welcome male clients to try The Bar Method! Will The Bar Method help me lose weight? Yes. The Bar Method’s exercise formula is especially designed to maximize weight loss while strengthening muscles. Most students who do The Bar Method regularly become slimmer and lighter, sometimes within months. The results are what keep our clients coming back. One of the reasons The Bar Method is so effective is that it intentionally targets your largest, most calorie-hungry muscle groups (those in your legs and glutes) and keeps them working at an intense pace. This combination of strength training and stamina building boosts the volume of energy you burn every moment during the class. Second, the Bar Method adds density to your muscle fiber, making your body more efficient at burning calories all day. Finally, The Bar Method’s quick and noticeable results – leaner and more lifted muscles – keep students motivated and feeling great about the transformation they can see in their bodies. It’s a great incentive to keep coming back and maintain an healthy lifestyle. How many calories can I burn in a Bar Method class? Most Bar Method students burn 250-500 calories in a class, and continue to burn additional calories for several hours after the workout, due to the intense muscle work. Just how many calories you will burn depends on a number of variables such as your weight, your fitness level, your age, your previous weight loss patterns, how hard you work during class, and many other factors. I’m working hard but am gaining weight. What’s happening? First, you’re in the first of two stages of body change where your muscles gain firmness. In stage two the fat around and between your muscles burns away. Stick to working out three-to-five times a week and you’ll reach stage two, during which you will burn off intra-muscular fat and your body will slim down, in about three-to-six months. Second, you’ve probably encountered the heightened exercise hunger that descends on your appetite when you first embark on a new strengthening routine. The reason for this sudden increase in hunger is that your muscles are in the process of getting stronger, and they’re crying out to be fed. Don’t worry! Studies have found that regular exercise does a “180” on your appetite once you reach a cruising speed of body change: It depresses your appetite! That’s why you’ll notice that the students are lean and strong at The Bar Method. So make strengthening exercise part of your lifestyle, make healthy eating decisions, and you’ll be rewarded with a leaner, lighter body. What is the “Bar Method tuck”? The “Bar Method tuck” is a stance that maintains spine neutrality during weight-work and muscle isolations. In this stance, students recruit their bodies’ three core muscle groups, those in their upper backs (shoulder stabilizers), their torsos (abs), and under their spines (glutes). The “Bar Method tuck” thereby keeps these stabilizer muscles working to protect students’ spines and also to enhance the effectiveness of the exercise at hand. I have very tight hamstrings. Can I still do the Bar Method? Yes! You should do the Bar Method, or some exercise form that includes gentle hamstring stretches which will help to increase the range of motion in your hips. The Bar Method works especially well because its alternating strength-stretch format exhausts your muscles before they’re stretched, allowing them to lengthen more easily. Several Bar Method stretches and exercises benefit the hamstring muscles, including: Stretch at the Bar, Round-Back and Final Stretch. Will I ever “plateau” with the Bar Method or will I keep progressing? No! Bar Method students overwhelmingly say that the workout is continuously challenging, whether they have taken 3, or 300, classes. It grows on them over time, many clients say they become addicted to the workout. The Bar Method technique is so precise that students can continually work work to improve their form. And, the results are so noticeable that students develop a craving for what they get out of the workout and ultimately for the workout itself. Can I take The Bar Method if I have an injury or medical condition? Yes! The Bar Method instructors are well versed in human anatomy and can help you modify exercises to ensure you are comfortable while maintaining the effectiveness of the workout. Be sure to tell your instructor about your condition so they can best assist you. Please read applicable sections below to discover how The Bar Method can work for you. Disclaimer: Always consult your physician before beginning any exercise program. This general information is not intended to diagnose any medical condition or to replace your healthcare professional. IT Band (ilio-tibial band) Syndrome is a painful condition that occurs when a hip muscle called the “TFL” tightens up from running or overuse in general. The Bar Method strengthens and stretches this muscle, thereby allowing it to release and calm down. In the meantime, if you have IT band syndrome, ask your instructor how best to modify in class to facilitate the healing process. Having a hamstring strain is painful -- and easy to do! Dancers, cheerleaders, athletes of all kinds, and people who engage in any type of exercise can strain a hamstring. And the diagnosis is not great after that, since hamstring strains don’t heal quickly and can become chronic if left untreated. For this reason, your first step on your road to recovery is to see your doctor. Once your doctor okays you to exercise, come back to class and tell your instructor you have a hamstring condition so he or she can give you the modifications you need to work safely. Then start slowly, be patient, and back off an exercise when you feel significant pain that is clearly caused by your injury and not a muscle burn. Remember, while you’re recovering from a hamstring strain, don’t get ahead of yourself and push too hard! Listen to your body, and use the above modifications as long as is needed for the best resolution. When your abs are weak, your body tends to compensate with other muscles. A “curl” motion might translate into an effort on the part of your neck rather than your abs. Your neck might also experience discomfort because of a natural tightness in your back muscles – not in itself a problem, but something you need to be aware of during ab work. The Bar Method curl section offers solutions to both these conditions. Teachers provide their students with mats and a cushion they can place under their ribs if needed, and will then show them how to position the back support to work effectively. In the curl section of class, students are free to work at their own pace and can sit up and reset when needed. With practice, most Bar Method students learn to do rhythmic curls with their abs and without neck discomfort. Foot, ankle and calf injuries including bunions and plantar fasciitis are extremely common due to women’s love of dangerously high heeled shoes, the hard pavements we dash around on, and how easy it is in the general course of life for our feet and ankles to be sprained and broken. The Bar Method is an ideal workout choice if you have one of these conditions. It’s non-impact, performed on a soft carpet, and provides special options for students with sensitive feet. As always, ask your Bar Method instructor for modifications as needed – he or she will be more than happy to help! Tens of thousands of Americans, most of them women, suffer from carpal tunnel syndrome, which is a compression of the median nerve at the wrist resulting in numbness and pain. An even greater number of people are genetically predisposed to this syndrome by having a smaller than average opening in their carpel tunnel, the passageway through which nerves travel through the wrist to the hand. Today, heavy computer use has increased the likelihood that these people will come down with the condition. Falling on a hand or wrist, a common injury, is another way people end up with wrist pain. Remember to use pain as a guide, and stop when you feel significant pain in the area where you’re injured! Always see your doctor before you attempt to exercise. He or she can give you effective treatments and therapies for your condition. The Bar Method has developed modifications for every exercise that exerts pressure on the wrists, so be sure to alert your instructor and take their adjustments for a personalized experience. By exercising mindfully, you’ll end up not only pain free but also with stronger joints that are less vulnerable to injury. Sciatica is pain in the buttocks and the back of the legs due to irritation of the sciatic nerve or nerve roots. It’s really a symptom of several different conditions, including a herniated disk, spinal stenosis, piriformis syndrome, sacroiliac joint dysfunction, and degenerative disk disease. If you have or have had sciatic pain, the Bar Method workout might be just what the doctor ordered. The Method originated as a therapeutic back strengthening program for a dancer who hurt her back. Consequently every exercise during the class focuses on strengthening, stretching or aligning the back. Our shoulder joints are especially vulnerable to injury. This goes back to when we evolved from four-legged to two-legged animals. When we began to use our arms, our shoulder joints became more flexible so that we could use them to throw and reach. This gain in flexibility caused the joint to lose stability. Bar Method arm-work is, for this reason, designed by physical therapists to help stabilize your shoulders by helping you strengthen the “stabilizer” muscles around them. If you have a shoulder injury, the Bar Method strongly recommends that you see a doctor before signing up to exercise. Physical therapy works well on shoulders, so you’ll optimize your recovery by putting yourself in the hands of a physical therapist before coming to a Bar Method class. Then, when you’re feeling better and get the ‘okay’ from your doctor to exercise, your Bar Method teacher will give you modifications to use in class that will help your shoulder continue to heal. Scoliosis is a common condition where there is an abnormal curvature of the spine to one side (a lateral curvature of the spinal column). Scoliosis may occur from weakness of the muscles around the spine or from the spine not fully developing with growth. It may create an imbalance in your posture muscles, abdominal muscles and hip muscles. 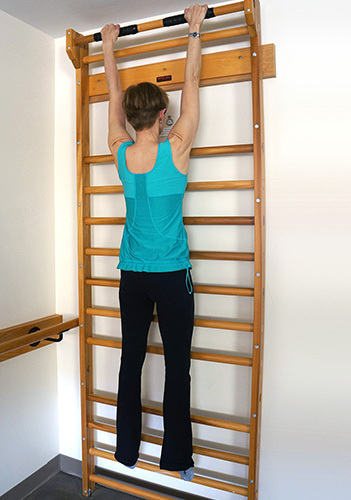 Scoliosis will not prevent you from doing the Bar Method in good form, though your back may look different in some Bar Method exercises than other students – especially in “one-weight lifts,” “fold-over” and “arabesque.” Ask your instructor if you need guidance on the correct alignment for you. The Bar Method is based in part on rehabilitative back therapy and has helped countless people to free themselves of back pain. The Bar Method’s exercises work because they “rewire” the connection between the core muscles and the limbs. The standing seat exercise, for example, teaches you to keep your spine stable while using your glutes, thereby teaching your body to move from the hips, not the lower back. The Bar Method also frees up your lower back muscles by gently stretching them throughout the class. Doctors say that exercise is the best therapy for varicose veins. Getting the heart pumping helps send blood through the veins and discourages the pooling that's the cause of the condition. The Bar Method has helped fade veins in some students. Its “round-back” exercise, which works the legs upside down, is especially good therapy for varicose veins since it allows gravity to draw the blood from your legs and back to your heart. Before you begin an exercise program, get your doctor’s okay to exercise. Then stick with the routine for at least six weeks if you can. Improving your fitness levels and getting stronger might help to alleviate your discomfort. If you have any type of knee injuries, it’s important to see your doctor for diagnosis and treatment before you exercise. After you get your doctor’s okay, the Bar Method workout can help you stabilize your knees by strengthening and aligning the muscles around them. This non-impact, highly controlled leg work is similar to what you’d do in physical therapy, and its gentle intensity is highly effective rehabilitation when you’re at the recovery stage. The Bar Method’s thigh exercises, are especially beneficial to the knees and can help alleviate most common knee conditions. The Bar Method’s thigh exercises use the bar to help you keep your torso vertical rather than having it lean diagonally forward as in a classic squat performed in the gym. This difference acts to make your quads more elastic, increase the range of motion in your hips, and give your legs a streamlined look. Almost half of all women past menopause will develop a dowager’s hump, and you don’t want to be one of them. The Bar Method is ideal for keeping your bones strong and dense because its exercises are weight-bearing but non-impact, a perfect formula for putting the right amount of stress on your bones to build density without jarring your joints. Second, the many stretches performed during the class cause your muscles to tug at their underlying bones, stimulating your bones to grow stronger. Stretching also helps prevent impact injuries by making your muscles more elastic. Third, The Bar Method’s emphasis on strengthening around the hips and back helps prevent osteoporosis just where your body is most vulnerable to losing bone mass. Fourth, the posture exercises performed during the class reduce stress on the spine and shoulders. And finally, its balance work at the bar helps you steer clear of injuries from a fall. If you already have osteoporosis, ask your doctor’s advice on the types of exercise you should and should not be doing. Hip sensitivity can arise from many causes, among them years of running or dancing, inherent hip tightness, or simply being out of shape. The Bar Method workout features protections against overuse of your hip-flexors combined with non-impact core strengthening to stabilize and protect your hip joints. Inform your instructor if you have sensitive hip-flexors and they will provide you with modifications that will allow you to workout comfortable. Additionally, the work you’re doing to strengthen your quads and abdominals will contribute to the health of your hips in the long run. Studies of patients with fibro-myalgia have found that low impact aerobic exercise and gentle stretching can decrease pain. Medical experts do not recommend intense weight lifting because it can result in excessive muscle soreness. So while the Bar Method is safe to do if you have fibro-myalgia, you’ll need to take occasional breaks during the class, especially at first, to ease the muscle-burn associated with the strength work. Tell your instructor about your condition, so he or she understands your need to rest. If you get over the hump of initial soreness from your first Bar Method classes, your added strength, flexibility and improved posture will lessen the stress and strain on your muscles and joints. Other benefits of strengthening and stretching workouts are reduced depression, improved sleep and more energy. See your doctor for pain management if you have a severe case of fibro-myalgia. The National Institutes of Health calls exercise “so important” for those with lupus because “too much rest can be harmful to muscles, bones and joints.” The NIH’s patient handout also says that exercise “can help you feel better, both mentally and physically.” Over the years Bar Method students with lupus have reported that their affected joints feel better after their Bar Method classes. Most of all these students have talked about overall increased well-being. All this said, check with your doctor before starting The Bar Method or any other exercise program. Exercise headaches are a common medical phenomenon. They're usually caused by vassal dilation in the temporal arteries during intense exertion. We recommend that you discuss your headaches with your doctor and ask him or her about medications and other courses of treatment that could help. How do I Take the Bar Method When I’m Pregnant or Post Natal? How Do I Begin Taking The Bar Method When I’m Pregnant? First, bring a note from your doctor stating that you can safely participate in strengthening and stretching exercise classes while you are pregnant. If you’ve never exercised at the Bar Method, we recommend that you take several Bar Online Pre-Natal classes or try out the Bar Method Pregnancy DVD so that your body gently becomes accustomed to the exercises and deep muscle work (while it’s already undergoing lots of other changes due to your growing belly). After you’re familiar with the class, it will be easier to start taking regular beginner or mixed class. How do I modify the class when I’m pregnant? Skip the stretch on the stall bar, which students usually perform before and after class, so as not to over-stretch your internal organs. During thigh stretch series, do not take the option to do a split (due to hormonal changes, pregnant students are more flexible in their hips so it’s important to stretch gently). Instead, stick with the “hamstring stretch” position. How do I modify the class when I’m 20 weeks or more into my pregnancy? For one-weight lifts, work with your back at less of a forward angle or hold onto the bar for balance. You can do pushups against the bar with your heels up or down. Do stretch at the bar in a kneeling position. In round-back, place three or four riser mats under your large exercise mat (your instructor will give them to you). Lean on the risers so that your spine is at no more than 45 degrees back. The risers allow you to gently stretch your lower back and work your lower abs at the same time. This position will keep the weight of your uterus from tiling back onto major blood vessels. Hold onto a strap over the arch of your extended foot. In flat-back, keep one or both of your feet on the floor if you feel uncomfortable lifting both at the same time. In curl, lean on three or four “riser” mats as you did during “round-back.” Substitute both versions of “clam” and “low curl with one or both legs up” with any of the other curl exercises that are taught with both feet on the floor. Start and stop as needed during the curl section. Modify “back-dancing” by kneeling in front of the bar and holding onto it rather than lying down. In the final stretch, replace butterfly stretch with a half lotus stretch. During the “strap stretch,” sit up and place one foot in the strap. Place your other leg with a bent knee on the floor for stability. What are the Options and Special Rates For Pregnant Students? During your pregnancy, Bar Method studios may offer you several special options and rates. Please check with your local Bar Method studio to confirm classes, pricing and special rates. Option 1: You can take the pre-natal class exclusively (if your studio offers it). Option 2: You can take the regular class and make modifications in the exercises as needed. If you are new to The Bar Method, please check with your studio to see if they have a requirement to have taken class before starting while pregnant. Option 3: In selected studios, you can take the first half of any class for half price (the first 1/2 hour focuses on the arms and legs.) Ask your local studio if it participates in this program. Option 4: You can alternate among the above three options. What does each of the difficulty levels mean? Beginner – A simpler class with concentration on learning the technique and set-ups with fewer reps in each exercise. Method - Full Body – Our most popular classes aimed to suit all clients regardless of fitness level. A perfectly balanced class with clear set-ups for each exercise and challenging techniques. Method - Targeted – Ideal for any level and is targeted to one focus area or small combinations of muscle groups. Often our targeted videos are shorter in length. Advanced – A faster paced class with limited set-ups, more exercises, challenging positions and advanced techniques. This level is ideal for clients who are already familiar with Method classes and want to push their limits. Prenatal – A Method level class for prenatal clients with specific modifications given throughout. Do I need any special equipment or props for the workouts? No special equipment or props are required. You can use water bottles for weights, bathrobe tie as a stretching strap, firm oversized pillows, a towel folded in thirds for knee padding and a sturdy chair or furniture for balance support. We suggest doing the class on a carpet, rug or mat so your joints are cushioned. You may also purchase Bar Method workout accessories at shop.barmethod.com. I already have a membership at a studio. Do I still need to pay for Bar Online membership? Yes. Bar Online membership allows you to stream classes online wherever you are - when you’re traveling or from the comfort of your home. Will I be able to access Bar Online on my tablets and smartphones? Bar Online is accessible on tablets, smartphones and any other devices that can access the Internet. How can I view Bar Online videos on my television? You will need a smart TV that can access the Internet directly. Apple TV (with Apple Airplay turned on) and Chromecast devices can also play Bar Online videos on your television. On mobile devices, you could be experiencing streaming issues if you are watching videos over the mobile connection (3G or 4G rather than an internet connection). Bar Online workouts require a broadband connection for optimized viewing and we recommend a wifi connection. - An internet connection with 500+kbps download and 150kbps upload speeds. - Recommended Browsers: Google Chrome and Mozilla Firefox. You can place an order after creating a Bar Method Store account, which is separate from other services such as Bar Online, or for The Bar Method Studios. I forgot my log-in / password information and get an error. Please Contact Us with a description of your issue. For security purposes, you will be asked security questions to confirm your identity. We currently accept all major credit cards; Visa, MasterCard, American Express, Discover, JCB, and Diners Club. We are currently using UPS. We also provide online tracking information for your order. Shipping cost varies by product weight, packaging, zip code, and shipping method. All are calculated automatically via the store website. Important: Please double check the address entered for shipping location. It should be entered exactly how it is shown on your regular mail, or an error may occur that will delay your order being processed. What shipping should I pick if I don’t live in the United States? We recommend international orders to pick UPS Worldwide Expedited because it offers complete tracking and delivery confirmation. Due to regulations with Customs, international orders are subject to longer than normal transit time which is also affected by the destination point as well. Please note that delivery can take up to 4-8 weeks from the date we ship until its arrival due to the clearance from Customs. The Bar Method is not responsible for any additional charges incurred from Customs (duty or taxes), postage, insurance or any additional charges after the order has shipped. I did not receive a confirmation on my order or its delivery information. Make sure any mail from The Bar Method is approved in your email to avoid it showing up in your junk mail. Check any junk mail folders for any emails from [email protected]. If you are sure you have received nothing, please contact Customer Service for further assistance. My order is shown as delivered but I have not received it. Depending on the type of of shipping picked, simple mistakes can occur like accidental delivery to a neighbor. If not, please Contact Us with your inquiry. I ordered the wrong item(s) / quantity. Please Contact Us regarding your order as soon as possible and state your Order number in the subject line to look up your order quickly. I received an incorrect order, or I did not order these items. If you receive an order that was not placed by anyone at that household, please Contact Us with any questions and inquiries. The Bar Method will replace any defective item(s) within the 1st 60 days after the purchase date. Postage will be charged to the client for orders older than 30 days. Note: Please read the policy carefully and Contact Us before sending out any items. Shipping instructions below under "Important" paragraph. Items purchased not via the store website is not returnable to the store site. You must contact the specific studio/store location in which the item(s) were purchased. Opened DVDs (non-defective) cannot be returned for a refund. NO exceptions. Defective DVDs can be returned for exchange of the same title only and must be reported within 7 days after delivery. Replacement will only be sent once the defective is received. If the defective DVD received is working through testing, we reserve the right to send the same copy back to you. If you have modified the DVD in any way, it is no longer returnable for exchange. This includes, but is not limited to, writing, labeling, or alterations on the disc. Unused workout accessories/ equipment can be returned for refund and must be reported within 7 days after delivery, NO exceptions. Defective workout accessories/ equipment can be returned for exchange for the same item only for a refund and must be reported within 7 days after delivery, NO exceptions. Apparel can be exchange for a different color or size or full refund within 7 days after delivery. Item must be unworn, unwashed, undamaged and unused with all original tags and packaging. We reserve the right to refuse a refund if the returned apparel does not fall within the previously listed criteria and will ask you to pay to have it returned to you. It is the customer’s responsibility to inspect and report any defects, shortages, returns or exchanges to Bar Method Media customer service within 7 days after delivery. All claims reported after the 7th day will not be honored, NO exceptions. Please contact The Bar Method Store Retail Support beforehand to ensure your request falls within the seven days and the arrival time back to our distribution center is not counted against the time frame. Shipping charges for the initial purchase are non-refundable. Shipping charged for returns / exchanges are non-refundable regardless of circumstances. There are no exceptions in this regard. If you wish to return/exchange any of the merchandise under the policies listed above, the return/ exchange merchandise shipping fees will need to be covered by the customer. Shipping charges for orders that are deemed “undeliverable” by the shipping carrier are non-refundable. Please ensure correct “ship-to” address, as we do not modify shipping addresses in any way before they leave our distribution center. All products sold on this site are Official Bar Method items (excluding the portable ballet barre). -Grip socks – Lots of different colors and designs, some with motivational phrases. Do you have any online streaming workout videos? Streaming workout videos are available at Bar Online. Subscriptions range from daily to monthly services. Is the Bar Method right for me? The Bar method works for all body types and exercise levels. Please visit your doctor before starting any type of exercise or physical activities. The Bar Method is a non-impact workout designed by physical therapist to be gentle on your joints and rehabilitative. The Bar Method can for you if you have certain injuries and conditions such as; knee, shoulder and wrist injuries, lower back pain, arthritis, or scoliosis. The Bar Method can become highly challenging with its ability to generate intense muscle burn and the necessity of your full attention to the positions of the workout. These qualities make the Bar Method suited for anyone as long as they are able and willing to stick with the exercise as muscles are feeling a burn and shake due to the positions and small isolated movements. The Bar Method is most effective and recommended for post-adolescent bodies only. Which DVD is right for me? Change Your Body Workout and Accelerated Workout: The start and next level of workouts that emphasizes more of the techniques used in The Bar Method as you progress. Super Sculpting Workout and Super Sculpting II Workout: The most advanced level of The Bar Method. These are best for those who are more athletic and are very familiar with the techniques and stamina needed to properly complete the workout. It is recommended, but not limited to, those who have taken a class at one of our studios to really understand correct form and techniques. Can I still do The Bar Method if I am pregnant? Pregnancy Workout: This workout is excellent for those who are pregnant and have certain limitations during their pregnancy. What makes this DVD even more useful is the fact that the instructor and performers are all in their 2nd and 3rd trimester, to showcase the actual capabilities a pregnant woman can accomplish with this workout routine. Note: All DVDs are coded for Region 1 (U.S. and Canada) and can be played on multi-regional devices (Region 1,2,3,4,5,6, & 8). Are you coming out with any more DVDs? You can get up to date information by clicking ‘LIKE’ on our Bar Method HQ Facebook page. Stay updated on latest studio openings, DVD releases, products, apparel and promotions. What do I need to start the workout at home? - A portable ballet barre or something equivalent such as a straight back chair that you can hold onto that is about the height of your hip / waist. - Two 2-to-4 pound free weights or something similar that you can comfortably hold on to during the workout routines. - A soft exercise mat or a soft, carpeted floor can work. - A stretching strap or something similar such as the belt of a bathrobe. - A small throw pillow may be needed for the abdominal exercises. - The two Super Sculpting Workout DVDs require an exercise ball that is 7-inches in diameter when filled with air. 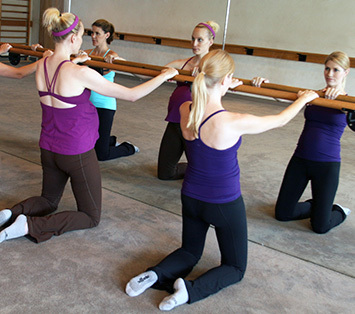 Where can I get a portable ballet barre? Visit our store site The Bar Method Store under the Equipment category. The ballet barre is also available in many packages as well. Please note that this is not the same ballet barre that is shown in the DVDs, nor at any studio locations. How often should I do the workouts and when will I see results? We recommend you do the full workouts from the DVDs a minimum 3-5 times per week. Most people begin to see results as early as three weeks. This is all possible depending on how often you perform the workouts, which level of intensity, and your diet. On average students of The Bar Method see significant results around three months of consistent diet and exercise. How do I know when to move on to the next DVD? 1. With your current DVD workout, are you doing all of the exercises and movements with good form and positioning? 2. In the exercises, are the muscles being targeted being worked out? 3. Can you maintain most of the exercises until the end without losing proper form and posture? If you confidently answered yes to all three questions, you are ready take on the next level DVD(s) and learn those routines. If you answered no to any of the three questions, please continue with the workout routine until you can confidently answer yes. Please visit our main website The Bar Method for state-by-state breakdowns of currently open studio locations as well as opening soon locations. You can search by zip code for any studio locations that are currently open. Where can I get franchising information? We can only consider an applicant as someone who has done The Bar Method at least 3 times per week for a minimum 3 months consecutively at either a Bar Method studio or with The Bar Method DVDs. Studio owners are required to teach classes and serve as role models for other teachers in their studio. They are to maintain high standards of quality in all aspects of the business and workouts. If you are interested and would like more information, please visit The Bar Method Franchising site. Can I use the E-Gift Card I purchased on the store website at a studio? The E-Gift Card purchased on the store’s website can only be used to purchase items at The Bar Method Store.